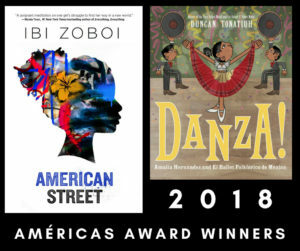 This year marks the 25th year that the Consortium of Latin American Studies Programs CLASP will honor the work of the many authors, illustrators, publishers, educators, and readers of the award with 2018 award winners Ibi Zoboi and Duncan Tonatiuh. Zoboi’s book, American Street is a complex and multi-layered story anchored around relationships and questions of loyalty. She shared her experiences writing this book and provided context for teaching this book in a high school classroom. The second 2018 award winner by Duncan Tonatiuh, Danza is a magnificent celebration of Amalia Hernández, the dancer and choreographer who founded the famed Mexican dance company, el Ballet Folklórico de México. Tonatiuh shared with educators his unique illustrative style and engaged participants in an exploration of Amalia Hernández and her impact in the world of dance. This picture book is the perfect book for every library. The workshop explored this year’s winners, providing guidance and resources that span the 25 years of the award. This special 25th anniversary workshop focused on diversity and the role of community. Contact Colleen McCoy [colleen.e.mccoy@vanderbilt.edu] for more information.